Guts Casino is never shy to celebrate an occasion with an interesting promotion. The casino often offers outstanding prizes in slot tournaments or raffles. 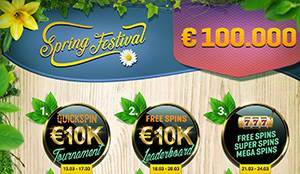 Now, the casino is celebrating spring with nine separate promotions over the next month and prizes totalling €100,000. Promotional details: The promotion is active from the 15th of March to the 14th of April 2019. You'll need to opt-in for the main promotion and for each separate promotion that you wish to participate in. Each promotion has its own terms as well. General bonus terms apply. There are nine separate promotions, each with their own terms attached. The promotions include leaderboard tournaments where you have to play selected games and fulfil missions or tasks, or you can get free spins or win random cash prizes. If you participate in at least one of the nine promotions, you'll also take part in the main raffle. Join the Guts Spring Festival Now! Guts is an established sports betting, casino and poker operator that has been operating for many years and has a great reputation with players. The casino currently offers over 1700 games from many popular developers, and players from many countries can also receive a generous welcome bonus with fair conditions. You can find out more about Guts in our detailed review, or take a look at our Guts Casino FAQ.